These trails are designed for first-time road bikers, although some of the circuits require mountain bikes or all terrain bikes. These loops are short and low-intensity, offering families the chance to explore quiet, little-known areas in the inland and illy/mountains régions of the Alpes-Maritimes. Relaxing and exploring are the key words here: break the day up with a picnic or luxurious lunch stop in one of the region's quality restaurants. This 1½ hour tour is appropriate for young children and families. It offers a wide path for riding together in exceptional surroundings. This cycle tour starts from the sea and goes up to the old village of Villeneuve Loubet. 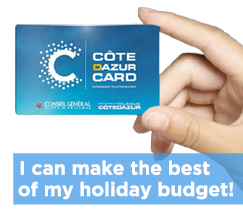 It is accessible for all, and cyclists will discover the various facets of Villeneuve-Loubet. This cycle path is close to the sea, and is safe, secure and accessible for everyone, even the youngest children. It will show you the multiple aspects of the Var river and its tributary, the Estéron. This itinerary is situated at the entrance to the Mercantour National Park. It is accessible for everyone, and families can discover the natural settings in this protected area. Accessible to all from the “Portes du Mercantour”. Starting from Nice or Villeneuve-Loubet, follow the “Côte d’Azur” coast along 15 km, with its blue Mediterranean sea and sumptuous landscapes. 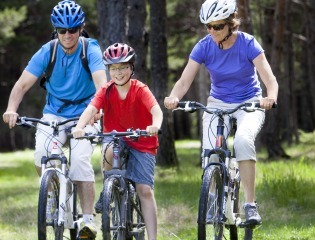 Enjoy a wonderful family experience during a safe ride that is accessible to all cyclists levels. Located in the towns of Valbonne and Mougins, the Valmasque county natural park park stretches across 432 hectares. Kids will love this spot where families can enjoy spending quality time together during some wonderful observation and nature discovery paths, games, and sports trails.